Spring is here! Okay maybe not really, but we’ve been getting some unseasonably nice weather in Washington, while so many of my friends in other states are getting the crazy weather we usually have. 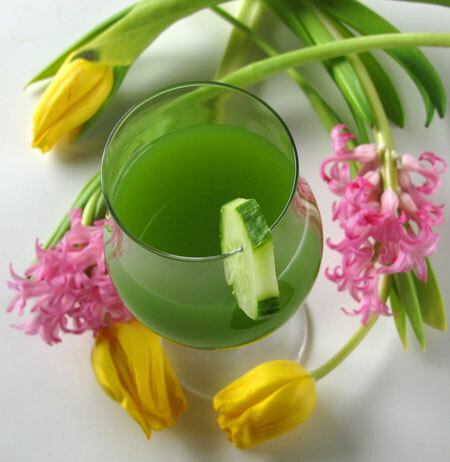 So I thought I’d share a drink that’s sure to make anyone in any location feel like spring is on the way. 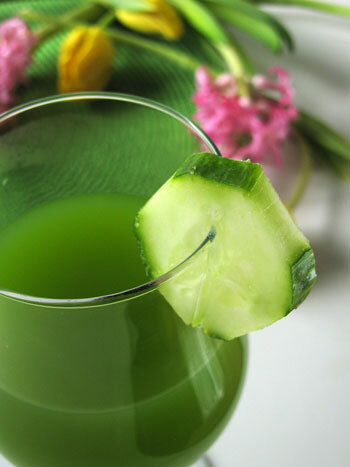 Fresh cucumber juice is so simple to make, and it’s a beautiful fancy drink that’s perfect for parties. Plus it’s alcohol free! I think it’s finally time to talk about my views on alcohol, since I do have some very specific and personal views. I went through some difficult and painful experiences as a child and teenager. There was a time that I used alcohol and partying to try and help me escape my hurts and pretend those things hadn’t happened. Eventually I realized that my problem was that I needed to acknowledge my hurts and work through them. That was one of the hardest experiences of my life, but also one of the most rewarding. I went for a couple years without drinking any alcohol, and once I felt secure enough in my emotional health, I began to allow myself the occasional drink again. Because of my past, I only drink alcohol if it’s something I really like the taste of, and I DON’T get drunk. That’s very important to me for a few reasons. I don’t want to go back to my old habits of running away emotionally, I don’t want to lose my inhibitions or ability to make healthy choices, and I don’t ever want to hurt God, my husband, or anyone else by breaking my promise to not shut down emotionally through alcohol. So Eric and I have a one drink policy. Although I know it takes more than two drinks to get me drunk, it’s just safer that way. In fact we usually share a drink if we go out somewhere, which saves money too! I wanted to share that here for a few reasons. First of all, we run a recovery program for teens. That doesn’t just mean alcohol or drug recovery, but basically learning to deal with hurts in a healthy way. So although we are open and honest about an occasional drink, we have to keep in mind that it’s easy for our students to justify their actions by our own. So we try not to have photos of us drinking alcohol or things like that which could hurt the recovery of someone we care about. I also just want to be completely up front. I have some friends who will be scandalized that we drink alcohol at all because they think it’s wrong. I get my definition of wrong from the Bible, and it’s very clear that God doesn’t want us to get drunk, which I believe is for our protection (I know I’ve done stupid things I wouldn’t have without drinking!). So I’m sorry if this offends anyone, but I’m okay with it too. Finally, I have some dear friends who are alcoholics. I know what a terrible disease it is and so I want to make sure that anyone reading my site who struggles with that knows they won’t be judged here. For the most part I will share non-alcoholic drinks, or like my eggnog recipe, share options with or without alcohol. If a cooking recipe calls for alcohol, and there is a substitute available, I’ll try to share that because I know some people just can’t, or won’t, have alcohol in the house. 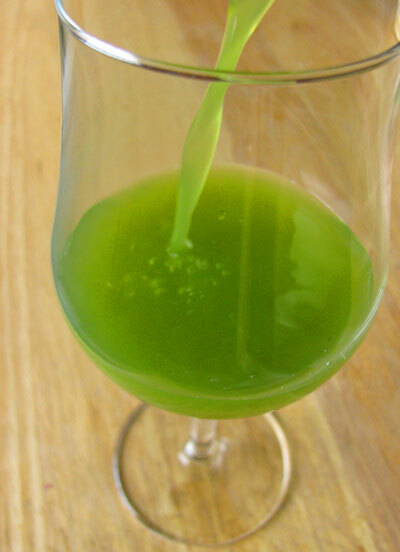 So, I can step off my soap box now and get on to this lovely drink of spring. It’s only got three ingredients, cucumbers, water, and a little sugar. Can’t you just picture yourself drinking this at a garden party, or out on a deck overlooking a field of flowers? 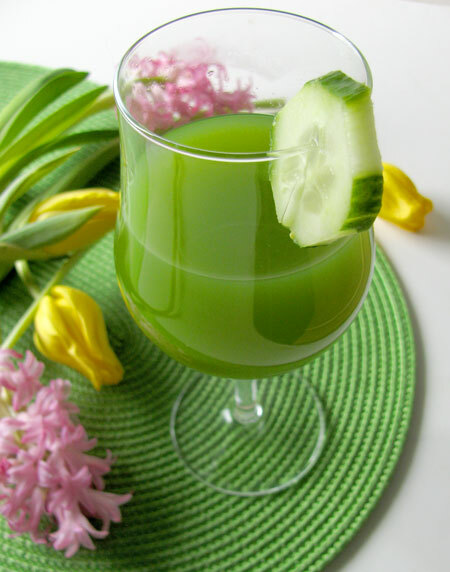 Every sip makes me feel refreshed and rejuvenated, and the color just cheers my soul. Peel the cucumber, saving the peels. Use a box grater to grate the cucumber into a bowl. 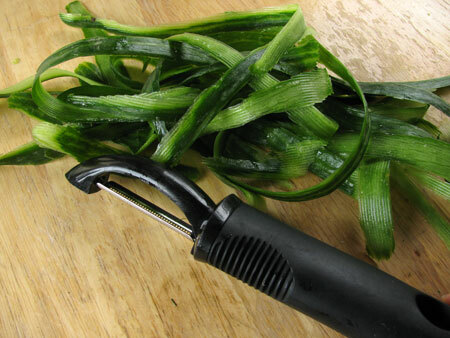 Bring sugar and water to a boil in a pot, add the grated cucumber and simmer 10 minutes. Pour contents of the pot into a blender and add the cucumber peels. Puree completely. Place a strainer over a bowl or pitcher, line the strainer with cheesecloth. Pour the cucumber puree through the cheesecloth. When most of the liquid has drained through, gather the sides and squeeze any remaining juice from the cheesecloth. Chill at least one hour, serve over ice (if desired) and garnish with cucumber slices. Approximate cost/serving: Only $1.10 for the batch (for the cucumber and the sugar). This made four servings for us so just 28 cents a serving. Vegetarian/Gluten Free: Yes and yes! I already knew that I liked you the instant I met you, and have continued to enjoy your company everytime we see each other. But the more I learn from your posts (and your About page! ), including and especially this one, the more I also admire and respect you. Thank you for your open honesty and your commitment to healthy choices. It inspires me. That does look like a fresh breath of spring. I appreciate you sharing your views here. I appreciate that you’ve shared your views in a sensitive and knowledgeable way. You obviously understand what the Bible does and does not say about consuming alcohol, and I’m happy to see that you aren’t one of the ones that tries to make your choices all about “honouring the Lord” by never touching evil evil alcohol. 🙂 My husband and I love Jesus, and we love our friends and family. We make our choices around alcohol based on who we are with and when: if someone has a previous issue with alcohol for any reason, we just won’t drink around them. It’s a matter of respect. I really appreciate you posting about this! I agree – getting drunk is wrong, but having a drink is not. I have never had alcohol myself, but that’s a whole other story. 🙂 Thanks for sharing! Diana– Thank you so much for a beautiful post. No wonder I like you so much! I LOVE cucumber anything. The last time we lived in Japan, Pepsi came out with a CUCUMBER soda. It was a little strange, but actually quite good! I definitely need to try this! Go Woman! I hope others can gleam hope from your story. This was such a beautiful photo… so full of spring and life. Your words are brave and inspiring. So many have these demons nipping at their heels. Addressing yours gives hope to others. And I agree, having a drink is fine… it’s when the drink has you by the throat that you are in trouble. Thanks for opening up and sharing your heart. I deeply respect your views on alcohol and agree totally. Other people’s drinking has caused a lot of pain in my life, so I generally choose to avoid alcohol. However, a pina colada at poolside in Mexico can be wonderful! But a virgin one is fine with me! I do not need alcohol to have a good time. Thanks for setting a good example for the kids. And may I get on MY soapbox? For pregnant women, or those trying to get pregnant, NO amount of alcohol is okay or safe! This looks so good! So light and summery. I love finding delicious, non-alcoholic drinks that aren’t too sugary. Hi Diana, I am looking to substitute stevia for the sugar. Do you or anyone else know how that would convert? The problem is usually that there is less bulk to work into the recipe. I’m going to experiment if no one has experience and I’ll let you know how it goes! 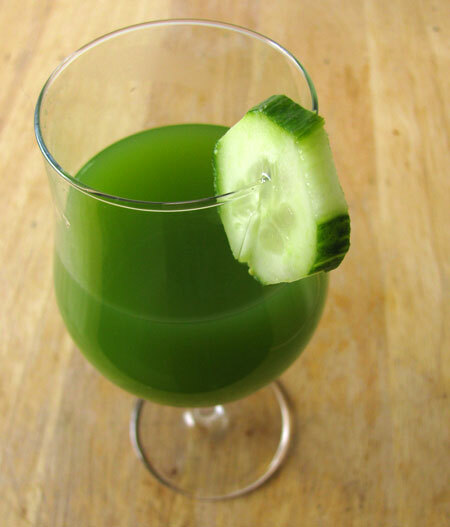 Just stumbled upon this page looking for cucumber juice recipes. Very impressed with your honesty, balance & love for Jesus! Keep shining & loving others through Him!